From the interior of the Earth Awareness Portable Classroom, the earth can be seen in its entirety for the first time. Continents are viewed in their true relationship to one another on the earth, not distorted as flat map projections show them. 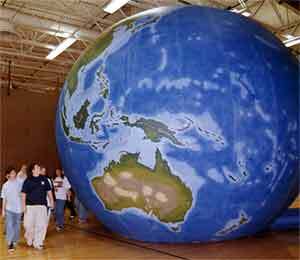 The Earth Awareness Portable Classroom is an inflatable, color, scale model of the globe. This hand-painted balloon was made by one person and took 500 hours to complete. It is 22 feet in diameter, which offers a unique perspective to those who step inside. The scale of the balloon is one inch equals thirty miles. Foundation staff present short informational programs focusing on geography and the environment. 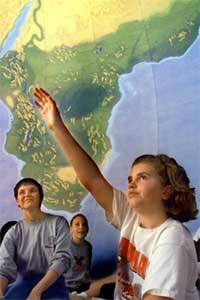 Presentations focus on physical aspects of each continent as well as reinforcing general map skills. Iowa and the immediate Quad Cities region. Presentation site is responsible for moving the equipment from vehicle to the space where it will be set up, and back to vehicle afterward. The equipment consists of two parts: a duffel bag weighing approximately 70 pounds and a carrying case weighing about 25 pounds. Foundation staff must accompany the Earth Balloon; an assistant from the presentation site may be requested. The foundation offers this resource FREE of charge. However, mileage, lodging, and incidental expenses for foundation staff may be requested depending on the distance from Muscatine, Iowa, and the circumstances of the presentation. The inside of the balloon is similar to an echo chamber. Therefore, any noise outside the balloon seems even louder inside. For this reason, no other activity can take place in the area where the balloon is being used. Shoes must be removed before entering. No punching, kicking, or touching the balloon is allowed. Due to the fact that it becomes warmer inside the balloon, the space used must be kept cool. Warm gymnasiums on hot summer days do not work! Photos courtesy of the Muscatine Journal.